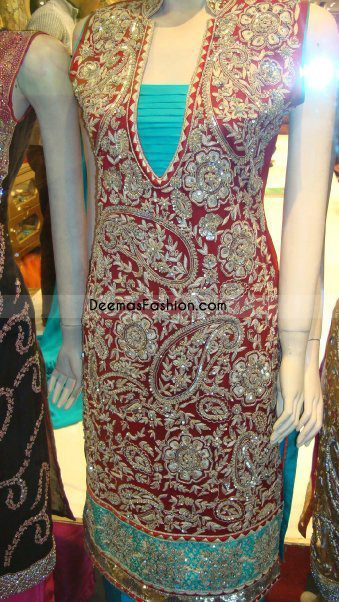 Red pure chiffon sleeveless rounded neck shirt has been endowed with embroidered V neckline and border at bottom Shirt is fully embellished with zari, Resham, tila, dabka, kora work etc. 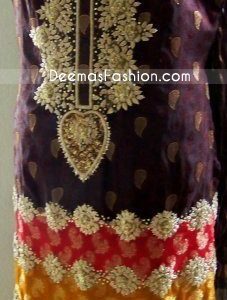 Ferozi appliqued used inside V neckline and border on hem which is adorned with floral embroidery as on shirt. Fully lined and finished with ferozi piping. 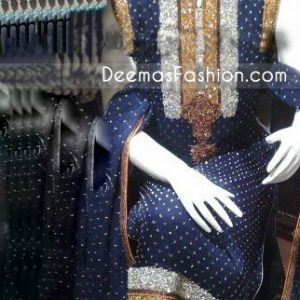 Bottom/Shalwar: Ferozi Raw Silk shalwar fully elastic waist.